Click here to find out about user interaction design. Click here to find out more about our electronic product case studies. ISDV was born out of a need to support digitised video capture of underwater chain measurement techniques for Welaptega Marine. The ability to record & encode digital video in an uncompromising and isolated environment, with affordable and effective resilience to failure was important to support offshore activities. Full frame level synchronised playback across multiple video streams was also required. 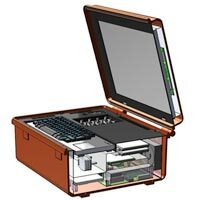 Designed around an off-the-shelf heavy-duty rugged case, the Explorer II provides an integrated, robust digital recording solution for industrial environments. It is designed to be resilient, scalable and reliable, and provides for multi-input digital audio/visual recording and subsequent data management, via an integrated catalogue. Brightworks team of design engineers assisted ISDV with the mechanical design of the internal chassis and design for manufacture and assembly. Ease of access for servicing and maintenance, modular design for scalability, cost & weight reductions, internal airflow for component cooling and robust design were just some of the requirements. Brightworks also detailed and specified the aluminium components and liaised with ISDV's manufacturing partner to produce a small initial batch of units for field trials and testing prior to full scale manufacture.